Are neckties part of your wardrobe? Did you know the fabric used to make your ties was cut on the bias to make neat knots? Unfortunately, this type of cut is easily distorted or stretched, causing puckering and fullness. Special finishes were likely used to stabilize the fabrics in your tie when it was made. 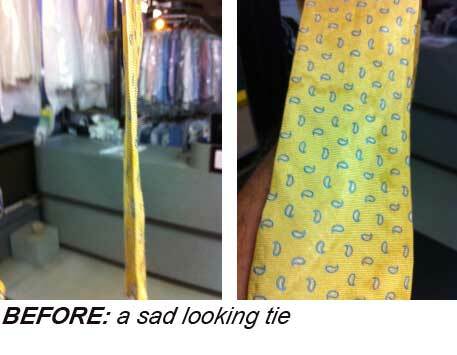 If you accidently remove those finishes while trying to clean your tie, the fabric will lose its shape and stability. It would be nearly impossible to return your necktie to a wearable condition. And sometimes your tie doubles as a bib and collects a variety of stains. 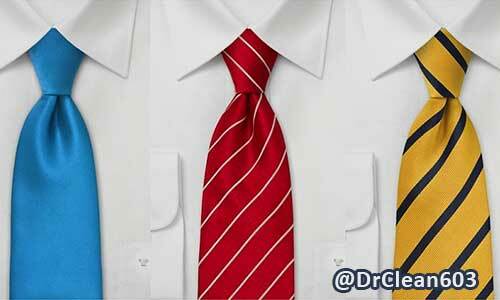 If you try to remove stains with water, you’ll probably disturb the dyes in the fabric, and ruin the tie. 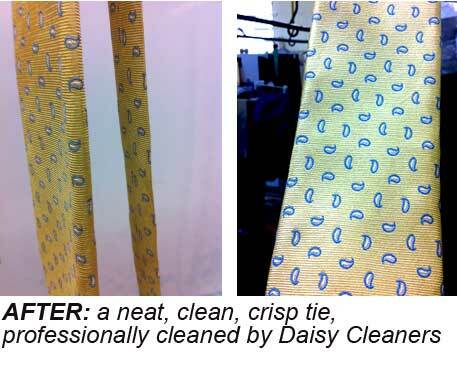 Let Daisy take care of your ties and you can get back to taking care of your business. When I talk about cleaning ties, I can't help remembering reading a clothing catalog from one of the very reparable clothing companies and reading how they do not recommend dry cleaning ties. This is mostly due to the finishing – the pressing and ironing practices - of many standard cleaners. You see, ties are made from a wide variety of fabrics. On the lower end they are made from polyester and the higher end ties may be made from wool. But generally, most high-end ties are made from silk which is a very delicate and beautiful fabric and must be treated with extra special care. The other challenge with cleaning ties is that the fabric used to make the ties is cut on the bias. Normally the woven pattern is straight up and down were bias is cut obliquely or diagonally across the grain so it naturally wants to shift and distort the fabric during the cleaning process. For example, the tie in this picture (that belongs to my son who lives in Philly) had a stain on it and was brought to a local cleaner for stain removal and cleaning. As you can see, the results speak for themselves! Notice the large ring, a result of not using a leveling agent after spotting, and the flat as a pancake pressing job. Definitely not a like-new look! 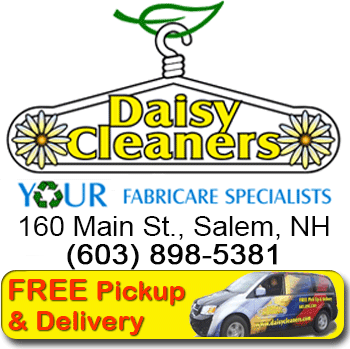 Well my son came home to Salem NH for a weekend visit and asked me if Daisy Cleaners could help. Again the pictures speak for themselves. The ring was removed and our careful pressing technique restored the rolled edge to the tie so it looked just as it had looked when it was purchased. Unfortunately all cleaners are not created equal. Do your research before selecting a cleaner to work on your clothes. Ask if they are a member of the Dry-cleaning Laundry Institute. Check online for reviews. But most important ask your friends and neighbors for a referral to their favorite cleaner. You’ll be glad you did your research! 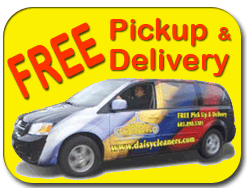 We'd love to be YOUR trusted cleaner!